Targets are customers for which you have some information but not enough to consider them as leads. They are not related to any contacts, opportunities or accounts and they are considered as stand alone records. In the next few lines of this tutorial we will provide more information on how to manage these records. In order to perform any management activity you will need to know how to access the main page where these activities can be performed. The Marketing Targets page is available under the Marketing > Targets menu. Once you access the Targets page you will be provided with a complete list of the already existing Targets you have added earlier. In order to create your marketing targets you have two options the first one is to use the Create Target link located in the top Actions bar. This link will redirect you to a well know interface for adding records into your SugarCRM CE instance which you might have already used in the other modules. 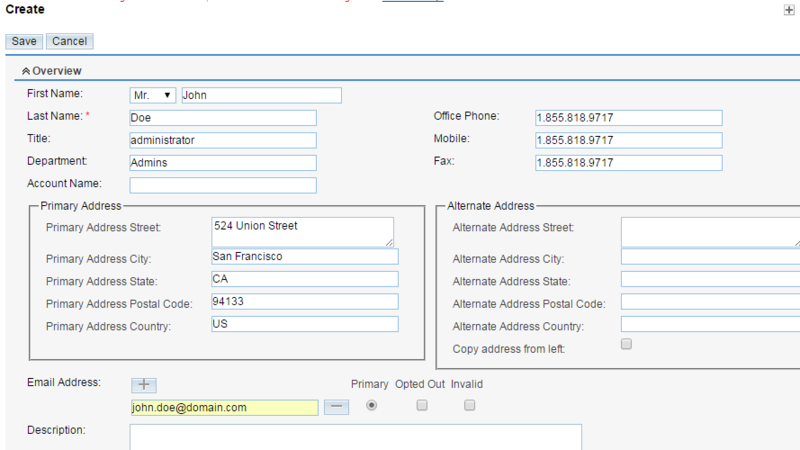 The available configuration fields are separated in few sections. The first one is called Overview and there you will be able to configure most of the settings. The next sections of settings are the More Information section where you are provided with the option to do not disturb this target over the phone and of course the Other section where you will be able to assign an employee to this contact. Once you are ready with all these configurations please use the Save button located at the top of this page so you can save the new target. The other option for creating targets is to import these if you have already existing exported file with targets. 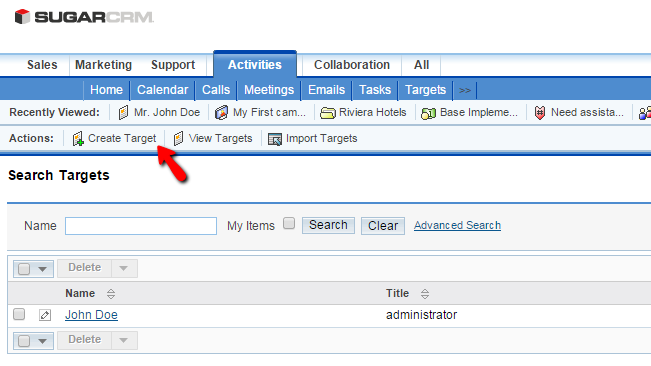 To import that file you will need to simply click on the Import Targets link located in the top Actions bar. In order to edit your targets you will need to access the home page as discussed in Step 1 of this tutorial. Once there you will see a full list of the targets you have added already. You should now find the one you would like to edit by using the search tool at the top of the page and click on the small pencil-like icon displayed before every target's name. This will redirect you to the same interface as the one you have used to add a target, however now there will be some information in the configuration fields already. Please alter that information or add new in order to edit the target and once you are ready simply click on the Save button at the top of the page so you can save the target. The last action is the deleting of targets and this is also quite a simple task. In order to delete a target you will need to first and foremost find the target you would like deleted. This can be done via the search module at the top of the Marketing Targets home page. Once you find the contact you will need to mark it by ticking the check box located right before the contact name and then to click on the Delete button. Once you confirm the deletion via the prompted pop-up your target will be permanently deleted. Congratulations! 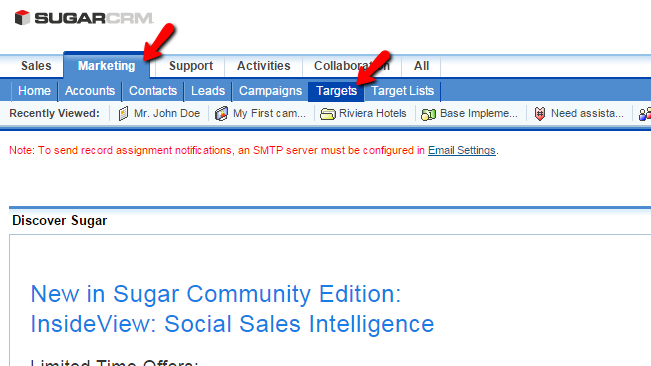 You can now fully manage the targets of your organization in SugarCRM CE instance!